Dimensional Weight frequently trumps Physical Weight! As of January 2015, carriers charge by whichever is greater: dimensional weight or actual weight. For example, an item might weigh only 4 pounds, but requires a large shipping box. LxWxH (Length x Width x Height) divided by 139 determines the dimensional weight of that box. If that result is 19 pounds, the carriers charge it as if it weighs 19 pounds rather than 4. Due to the large size of our cage components, almost all of our product sizes are affected by dimensional weight. In order to minimize the impact on shipping cost, we customize our boxes for optimal product fit, which in turn, reduces shipping fees as much as possible. With very large orders, we may be able to combine similar items together, condensing boxes, and we will always refund the difference if that’s the case. Some residential deliveries can carry a higher rate, and a number of zip codes carry an additional surcharge by the carriers as well. The shipping rates calculated during checkout are generated directly from UPS and Fedex and have our negotiated carrier discount applied. While our shipping rates can't compete with Amazon or other high-shipping-volume businesses, our attention to customer service and quality cannot be beat. Every company large or small must pay to ship their product to you. You’re paying for it somewhere. We are a small, family-run business and our products are created, customized and kitted for you here in the USA at fair, sustainable labor rates, which in turn, do not leave enough margin to cover outbound shipping costs without raising prices in order to stay in business. If we were to inflate our prices to cover shipping, we are then seen as too expensive. We're frequently compared to DIY pricing ("I can make it myself") where only basic material costs are noted, and shipping and labor are not factors. It's a challenge and we prefer to err on the side of complete transparency and fairness. My package didn’t arrive or it’s late. Keep in mind the delivery date shown on the carrier website is estimated. Occasionally, the carriers will initially show an estimated date of delivery that’s incorrect or the date might change to “pending”. It is best to track your package frequently and remember -- weather, truck issues, and scanning discrepancies -- can all factor into arrival time estimations and are beyond our control. We are not responsible for packages taking longer than expected. All our products are made-to-order. Most orders are shipped within 1 to 2 business days. However, we may ship your order the same day or we may need up to 4 business days, depending on our workload. Once your order is made and ready to ship, we’ll email you a tracking number. 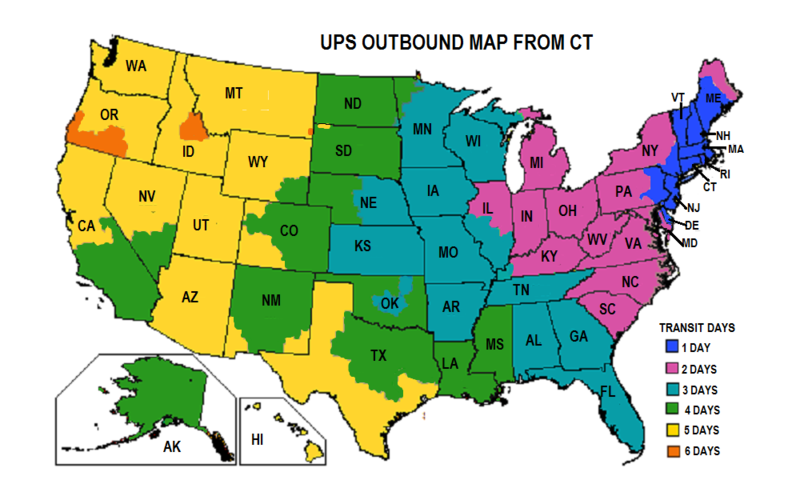 We ship from Connecticut, and the transit time to your area is shown in the transit map below. Please be sure to TRACK your package for the estimated arrival date. You must notify us within 48 hours if it’s showing it was delivered and you did not receive it. The longer you wait to report a lost package, the harder it is to trace it. Can you intercept my package or can I refuse shipment? Once an order has been fulfilled and shipped, we cannot intercept it. If you want to return it, it’s best to wait for the package to arrive, then request a Returned Merchandise Authorization number. Customers are responsible for all shipping charges incurred. If you refused, changed or cancelled your order while it is in transit, you are responsible and will be charged outgoing and return shipping charges.